Puerto Rico's Fast Taker grew from the desire of founding members Gabriel Colón (vocals) and Hector Torres (bass) to enliven the traditional metal scene of their Caribbean island home. Although the band has suffered several lineup changes since first coming together in 2000, Gabriel and Hector weathered the storm and have come away with a strong group of musicians including guitarist Yamil González and drummer José Colón. With a settled roster, Fast Taker entered the studio in 2004 to create their self-titled debut release. The band's music is, first and foremost, '80s influenced melodic heavy metal played with the flair and emotion of such memorable acts as Metal Church, Sanctuary, and Dio. The opening track, "I Can See", has reached the top of local rock charts and serves as a good choice to get the album started. A wistful lead from González soon gives way to scratchy riffing and José's crashing beats, keeping the song moving at a quick pace throughout. González noodles out a couple of solos during the latter moments of the track, showing off his superb style. Frontman Gabriel has acceptable range for Fast Taker's style of music, though his strength is clearly in his upper range (even belting out some wails that Halford and Dickinson would be proud of). This combination of both wild and precise guitar playing and "true" metal vocals makes the first track a highlight of Fast Taker, and bleeds through the remaining tracks to make most of them a quality listen. The next track, "Hopeless Addict", is my favorite of the album and introduces a bit of a departure in sound from "I Can See". Gabriel instills a bit of a punkish attitude in his vocal style and remains largely in his lower registry, with only a few shouts spaced here and there. The riffs bite deep on this track, with a ton of weight provided by Hector's four-string. González gets wild again with his solo, and the formula comes together to create a very catchy song. On the subject of catchiness, the majority of the choruses border on having that sing-along quality and so serve very well to draw the listener into the tune. The chorus on "Cry For Peace" takes that trait one step further and is one of the more addictive elements of Fast Taker, remaining in memory well after the music fades. After running at full steam for three tracks, Fast Taker slows things down with "Broken Dreams". A power ballad in the truest sense of the term, and having very much a Scorpions vibe to it (think "Still Loving You"), the song is the weakest of the 7 tracks. Yes, it does have that lighter-waving appeal to it, with Gabriel reaching deep to deliver a very nice performance, but the song simply fails to stick. The band follows the ballad up with "My Nature", another cut that dips below the standard set by the opening trio. Still, González is in great form here with some tumultuous solos and leads while Gabriel goes back to that slightly punkish style to give the tune a sleazy, hair metal aura. The final two tracks, "Reaching For Nothing" and "Morir En El Asfalto" (the latter sung entirely in Spanish), introduce yet another aspect of Fast Taker's sound. Hearkening back to the early days of Testament, Metallica, and Exodus, these tracks turn up the thrashiness and cloud the atmosphere with a doomy mood. The epic "Reaching For Nothing" ranks as my second favorite track, combining some great atmospherics, very expressive solos, monstrous riffs and quality vocal hooks. Having slightly stalled midway through the album, the band pulls out the stops and delivers big to wrap up the disc. With a core sound that is familiar and nostalgic, Fast Taker further injects a few thrashy elements to create an album that has cross-generational appeal. 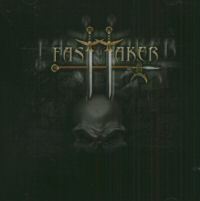 Fans of all the bands I've mentioned in this review will love Fast Taker for its recognizable sound, while those who favor more contemporary power metal will find much to enjoy in the fine guitar work and strong vocals. Aside from a slightly thin production, this album is a fun listen and a quality debut.